Incubator space offers economies of scale in South Park. John Vicory. PICTURED: Johnny Bianchi created a manufacturing "incubator" in South Park. One of the greatest barriers to growth for a manufacturing startup is finding affordable room to expand. In Seattle especially, where rent for industrial space is skyrocketing, companies are being pushed to Kent and Renton, and the city risks losing the blue-collar jobs so crucial to shoring up its shrinking middle class. Johnny Bianchi, a lifelong Seattleite, has an approach that offers small manufacturers a fighting chance at success. He provides an industrial space, complete with expensive equipment and shared amenities, at a competitive rent while they develop their businesses and grow their client bases. His modestly named Industry Space Seattle occupies a 47,000-square-foot building on Seventh Avenue South in South Park, complete with about 10 industrial work spaces, a furnished conference room and offices. Bianchi bought the building “in disrepair” from a friend in 2015 and remodeled it into a sort of manufacturing business incubator, where tenants have access to shared equipment that would otherwise impose prohibitive overhead costs to emerging companies. Much of the equipment left behind when he acquired the space had to be repaired, serviced and certified, but Bianchi eventually erected a skeleton that small companies could flesh out — and he had tenants within six months of purchasing the building. By mid-April, he had nine renters, nearly filling the building to capacity merely through word of mouth. Those tenants include businesses that produce LED lighting, custom metal manufacturing and 3-D printers for metal fabrication, among others — many of them with just two to four employees. Industry space seattle offers small manufacturers the infrastructure to operate efficiently. It gives tenants the use of 10 overhead crane systems, which can cost $60,000 to $80,000 each, Bianchi says, along with a $30,000 compressed-air system, a $20,000 forklift and an industrial paint booth. There’s a copy machine and a break room, and the conference room adds an air of legitimacy to a fledgling business working to make connections, Bianchi adds. Rental rates are competitive with other industrial shell spaces, Bianchi notes, but the additional equipment and services add value and savings. Loren Lyon, president and center director of Impact Washington, a nonprofit that offers consulting services to manufacturers in Washington, says incubators are “really helpful for someone with an idea [when] the garage won’t cut it anymore.” He says about six to eight manufacturing-focused incubators exist in the state, providing more hands-on assistance, such as business mentorship, to tenants than regular shared work spaces can. is co-owner of Seattle Bridge LLC. He moved his business from Ballard to Industry Space in 2016. 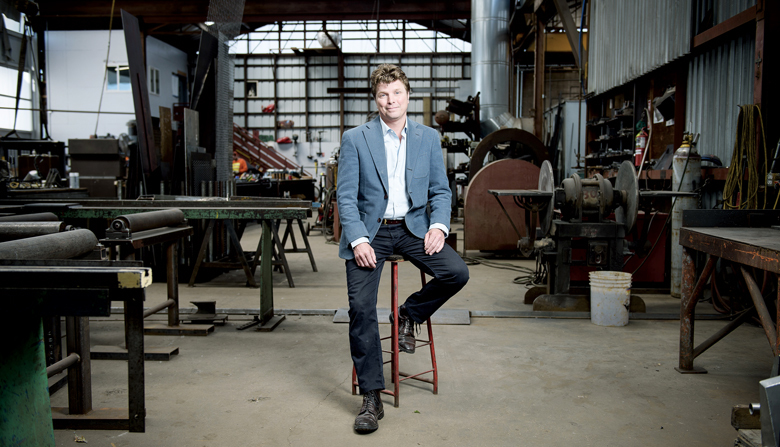 Industry Space Seattle has worked out well so far for Hans Hofstee, owner of H.G.H. Metalworks. His business does custom metal manufacturing and produces structural steel and architectural elements as well as furniture and artwork. He was Bianchi’s first tenant at Industry Space. Previously working in an 800-square-foot shared space, Hofstee wanted to expand to 6,000 square feet. At Industry Space, he found the amenities, equipment and location he was looking for. “Everything fit just perfectly,” he says. Lauren Formicola, VP of business operations at 3-D printing startup MatterFab, says Industry Space allowed her firm to hit the ground running. MatterFab was looking for a space where it could expand and meet other local industrial manufacturers. “Johnny is able to create a space where people can work together in a very purposeful building,” Formicola notes. MatterFab made use of the building’s roll-up doors and the shared forklift to move equipment. It also benefited from being neighbors with H.G.H. Metalworks; Hofstee let MatterFab borrow tools and even built parts for the new tenant, Formicola says. Bianchi is the de facto mayor of Industry Space. With his German shepherd, Storm, at his side, he chats with tenants and makes sure they’re taken care of. Formicola says the landlord comes from a family of givers who helped rescue the iconic Georgetown Hat ’n’ Boots roadside attraction in Oxbow Park and is now connecting his tenants with other people who can help them. Formicola says Bianchi has created a miniature community of manufacturers at his building. They often run into each other at Loretta’s Northwesterner diner during lunch. Still, he fears that growth in Seattle’s tech sector will eventually push neighborhoods like SoDo and South Park from industrial to commercial zones, squeezing out the manufacturers. He already mourns what’s become of industrial businesses in Ballard now suffocated by the neighborhood’s popularity among the young. Impact Washington’s Lyon adds that because of Seattle’s growing population density, ideas born in Seattle may naturally come to fruition elsewhere. Places like Bothell, Redmond, Woodinville and Kent are magnets for manufacturers producing anything from electronics to medical devices to plastics. While some companies may start in Seattle, the city certainly isn’t importing many manufacturers because of the cost of living here and the property price per square foot, Lyon points out. But Lyon maintains it’s important to preserve a manufacturing culture in the city, simply because it “adds character.” Manufacturing draws workers from all educational backgrounds and interests, and those businesses draw people in shipping, assembly, purchasing, IT, sales and senior management. With his business model at Industry Space Seattle, Bianchi says companies can join forces to do exactly that. Formicola says Bianchi has created a “heartbeat” for manufacturing in a corner of South Park and believes Bianchi’s business model could catch on.